This recipe was originally a Jamie Oliver recipe, however I’ve added my own twist! He has an incredible section of plant-based recipes on his website. Thoroughly wash, peel and chop all the potatoes into chunks. Keep the peels (excluding the sweet potato) to the side for later. Place potatoes in a pot of salted water and bring to the boil, add the sweet potatoes 5 min after. Simmer for 10-15 min or until tender. Drain and leave potatoes to steam dry, add the margarine and a pinch of salt and black pepper. Mash until smooth and set aside. Place the potato skins into a mixing bowl and add 1 tbsp oil and a pinch of salt. Mix thoroughly with hands. Lay the skins evenly onto a baking tray and place in the oven. Bake for 20 minutes and grill until crispy. Finely slice the onion and celery, finely chop the carrots and crush the garlic. 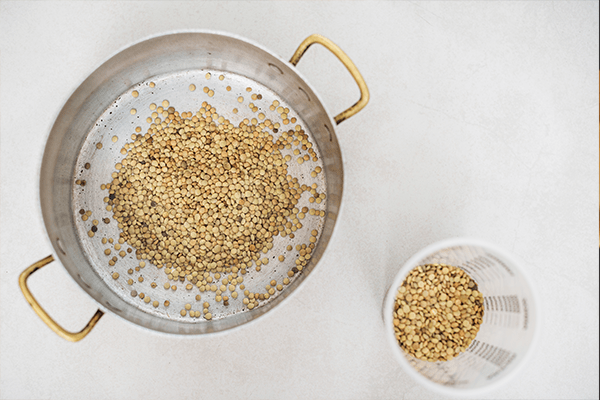 Bash the coriander seeds in a pestle and mortar until fine, then add it to a saucepan ver a medium heat with a spoon of oil. Cook for 10 in or until softened. Chop the mushrooms and sun-dried tomatoes, then add them to the pan along with the vinegar. Cook for a further 10 minutes, then add the wine, turn up the heat. Stir in the stock, lentils, chickpeas (if canned – include juices) and peas, and leave for 5 minutes or until slightly thickened and reduced. Crush the remaining garlic and place into a bowl with the rosemary leaves, lemon zest, breadcrumbs and 1 tbsp oil. Mix well. Pour the saucepan contents into the dish and add a layer of the mash on top. Switch to grill for a further 3 minutes or until golden brown. *if cooking chickpeas from raw, they will need to be soaked in water overnight and boiled for approximately 1-2 hours or until soft. Rinse and drain keeping about one cup of the remaining water.